Mavado's Birthday Bash "Jagra - Real McKoy," will have an international flavour this year with the addition of crooner Bobby Valentino, who is sure to bring the females out in their droves. 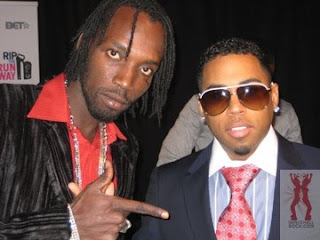 Mavado and Bobby Valentino worked on a remix of Bobby's Billboard smash "Hands on Me" together earlier this year, as well as collaborating on other yet-to-be released projects. The "Hands on Me" remix is a big hit on the local Dancehall scene and fans can definitely look forward to seeing Mavado and Bobby V sing the song for the first time together anywhere. "I cant wait to come back to Jamaica to see my ladies," said Bobby V, who has performed once before in the island. "Last time I was there it was crazy love and I'm thrilled to return and help Mavado celebrate his birthday in style. I'll be singing all the favourite hits for my females, we just gona do it up big for the Gangsta on his birthday!" Mavado's Birthday Bash, sponsored by Jagra, takes place on December 5th @ Temple Hall Estate, St Andrew and is packed with huge names from the local artist and sound system scene. Bounty Killer, Elephant Man, Sizzla, Busy Signal, Wayne Marshall, Flexxx, Chase Cross, Munga, Demarco, Vegas, Stacious, Spice, Lady Saw, the Gully Squad, Stone Love, Swatch, Sky Juice and Boom Boom are just some of the names on the stellar line-up. Security is the prime concern of Mavado for his event as he is determined to have another incident-free party where his thousands of fans can come and enjoy the festivities in a safe and secure environment. Police personnel and private security will be on site at all times to ensure the safety of patrons and their property. Atlanta-native Bobby Valentino's first single, "Slow Down," became a top 10 hit on the US Billboard Hot 100 chart and #1 R&B single Billboard R&B Singles. Lately he has seen huge success from his single "Beep" and for his unforgettable chorus on Lil Wayne's mega-hit "Mrs Officer." Tickets for Real McKoy, Dec 5th @ Temple Hall Estate are just $1000 pre-sold, $1200 @ the gate and $1500 VIP.